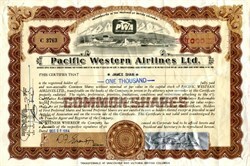 Beautifully engraved rare uncancelled stock certificate from the Pacific Western Airlines, Ltd. issued in 1964. This historic document was printed by the American Banknote Company and has an ornate border around it with a vignette of plane landing with Vancouver in the background. This item has the printed signatures of the Company�s President and Secretary, an dis over 48 years old. This is the first time we have had a certificate from this company for sale. Pacific Western Airlines (IATA: PW, ICAO: PWA, Call sign: Pacific Western) was an airline that operated scheduled flights throughout western Canada and charter services around the world from the 1950s through the 1980s. It was headquartered at Vancouver International Airport in Richmond, British Columbia until 1975, when the head office was moved to Calgary, Alberta. Pacific Western Airlines was a pioneer in the aviation history and known for its ability to profitably operate short haul air routes. The company had a proud culture of highly motivated young employees who saw great things in their futures. The company raised profits and reserves and eventually formed Canadian Airlines in 1987. It came to pass that Air Canada took over the entities that Pacific Western Airlines had created. Pacific Western Airlines was founded by Russ Baker, in Fort St. James, B.C., in 1946. With a leased Beech biplane, Mr. Baker provided air service to remote mining camps and logging operations in the North, delivering men and materials to isolated destinations. The Company was known as Central British Columbia Airways Ltd. and, from the beginning, had a reputation for on-time service, knowledge and ingenuity. In 1953, the Company adopted the name Pacific Western Airlines, the beginning of another important era. Additional companies were acquired, such as Queen Charlotte Airlines in 1955, giving the Company a foothold in scheduled services, and Associated Airways in 1955, leading to a vital contract in the construction of the Distant Early Warning line in Canada�s north. In 1958, Russ Baker died but the airline he founded with his Beech biplane in 1946 was thriving. At this point in time, the Company acquired a reputation for innovation and aggressiveness by developing several unique services for freight customers and passengers alike. The Calgary-Edmonton Airbus was inaugurated in 1963, with passengers carrying their luggage to the aircraft and depositing it on the ramp for loading. A ticket agent on board a 66-seat DC-4 would then collect the fare during the 55-minute flight. When the Airbus first started, it was estimated that it would take ten years to move one million passengers. That goal was reached in less than eight years. In 1966, in anticipation of a regional air policy for Canada, Pacific Western began placing orders for jet and jet-prop equipment. The regional policy became a reality in 1968, and the Company was able to add many more ports of call to the already long list of destinations in Western Canada. Services at this point stretched from the Pacific Northwest to the Arctic Archipelago. Boeing 707 equipment was added to the fleet in 1967, and Inclusive Tour programs were introduced to Mexico and Hawaii in the winter, with several European destinations for the summer. The addition of a cargo model Boeing 707 meant that livestock and perishables could now be carried all over the world, and the name Pacific Western became synonymous with �World Air Cargo�. The Company aircraft visited more than 90 countries during this period of time. Pacific Western operated a world wide Boeing 707 cargo and passenger charter program until the last aircraft was sold in 1979. In 1967, Pacific Western became the first commercial operator of the Lockheed Hercules freighter. The Hercules were initially acquired to support Canada�s extensive search for energy and minerals in Northern Canada. Then, following the Spring ice break-up, the Hercules would rejoin the main cargo fleet in world-wide operations. Diverse cargoes included everything from 21,000 kilos of dimes to 20,000 kilos of Christmas cake, and a shipment of electronic equipment to the People�s Republic of China, the first commercial air shipment to that country. In November 1968, the Company introduced �jet service� on its scheduled route system with the delivery of its first Boeing 737. Pacific Western was the first Canadian carrier to order the 737 aircraft. The �Stampeder Service� linking Alberta and B.C. began on December 17, 1968. Another transfer of licensing authority from CP Airlines to Pacific Western provided the Company with routes throughout the Interior of B.C. in 1969, and the acquisition and control of B.C. Airlines in 1970 enabled the Company to supply expanded air service to routes in the B.C. Interior and on the coast. With equipment such as the DC-4, DC-6, Convair 640, Lockheed Electra, Boeing 727 and Boeing 737, Pacific Western provided scheduled air service throughout B.C., Alberta and the Northwest Territories. As the 1970�s progressed, the airline�s equipment varied and the Company began a fleet rationalization program, concentrating on the 117-seat Boeing 737 as the backbone of the mainline fleet. By the late 1970�s, the Company operated an all-jet mainline fleet. In 1974, the Alberta Government assumed ownership of Pacific Western Airlines to assure the development of the North and Western Canada, returning the airline to the private sector in 1983. In 1978, the Company acquired the regional carrier Transair Ltd. of Winnipeg. In February 1979, in an agreement with the Canadian Transport Commission, Transair ceased all scheduled operations east of Winnipeg and Calgary/Edmonton via Regina and Saskatoon, Saskatchewan. This linked the Pacific Western/Transair systems, completing the first step to eventual merger. On December 1, 1979, all operating licences and routes were transferred to Pacific Western Airlines and Transair ceased as a regional carrier. Like Pacific Western, Transair comprised several companies. Their history dated back to 1947 with the founding of Central Northern Airways. In 1956, a merger between Central Northern Airways and Arctic Wings created the name Transair. The most significant of various amalgamations during the years took place in 1969 when Transair and Midwest Airlines combined their operations to form a diversified regional carrier serving prairie Canada to Toronto and the Arctic. By 1986 Pacific Western was the largest airline in Western Canada, carrying over 3 million passengers per year. In 1986, joint marketing agreements were signed with local service carriers � Calm Air of Thompson, Manitoba and Time Air of Lethbridge, Alberta, under the Pacific Western Spirit Program. Pacific Western employed nearly 3,000 people throughout Western Canada and Ontario. The airline went through several iterations, originally consisting of small float planes in the 1950s, evolving to include a varied fleet of Convair 640s and Douglas DC-4s into the 1960s. PWA had a major impact in the Arctic and was instrumental in providing service to many isolated communities. The airline also operated several Boeing 707 aircraft that served in both a passenger and cargo capacity. Along with a number of Lockheed L-100 (the civilian version of the C-130), PWA became a major player in the world air cargo business. The airline expanded to include a variety of aircraft, including Boeing 737-200s, Boeing 727s, and two Boeing 767-200 aircraft. The airline was briefly owned by the Alberta provincial government in the mid 1970s. In the early 1980s, the fleet was pared down to only 737-200 aircraft and became one of the most innovative airlines on the west coast of Canada, servicing communities throughout western Canada and across the country. In 1987, PWA Corp, the parent corporation of Pacific Western Airlines, purchased Canadian Pacific (CP) Airlines in its entirety, to form Canadian Airlines International. Wardair, another Canadian airline, was later purchased by PWA, resulting in only two major airlines in Canada: Canadian Airlines International and Air Canada. PWA and later Canadian Airlines were based in Calgary. In 2001, Air Canada merged with Canadian Airlines. Pacific Western Airlines Flight 501 was a regularly scheduled flight that flew between Calgary, Alberta and Edmonton, Alberta, Canada. The aircraft caught fire during takeoff on March 22, 1984. No one was killed, with only five people seriously injured and 22 with minor injuries. The plane burned to the ground as fire crews attempted to stop the fire.